One ship sails East and another sails West, with the same winds that blow. It’s the set of the sails, and not the gales, that tells them the way to go. And not the calm, or the strife. This is another shot from the Embarcadero in San Fransico, California, taken early one morning as the fog from the Bay was burning away. The entire area is a treasure trove for Photographers – old buildings, fishing boats, unique individuals, crab traps, great food and drink, a submarine… the list goes on. 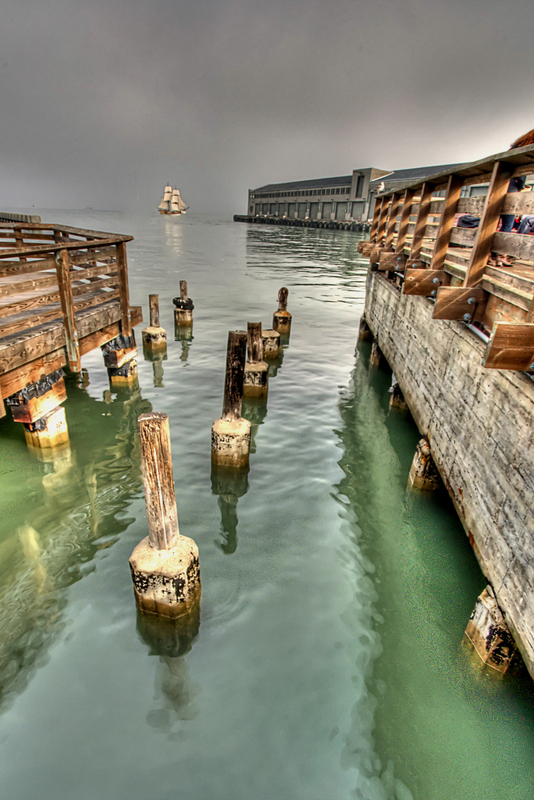 Here we were shooting the long lines of piers as they extended into the misty Bay when a Tall Ship appeared as if by magic. Using our tripod mounted Nikon D90 (10mm, f19, 1/8sec, ISO100, remote shutter release), we quickly aligned the ship with the lines of the piers and shot three exposures. Later these were combined with Photomatix to bring the entire dynamic range of the light to bear. No sooner than we had executed this, the ship had passed! Serenity means maintaining a sense of inner peace even in difficult situations. We gain serenity by accepting the things we cannot change and focusing our energy where we can make a difference. Fear, anger or desire can create a sense of urgency that triggers us to react impulsively. When this happens, we risk undermining our goals, damaging relationships–even violating our deepest values. By contrast, when we cultivate serenity, we don’t fear our emotions, but we do keep them in balance. We govern ourselves rather than being ruled by external circumstances and our feelings about them. Peace is present right here and now, in ourselves and in everything we do and see. Every breath we take, every step we take, can be filled with peace, joy, and serenity. The question is whether or not we are in touch with it. We need only to be awake, alive in the present moment . 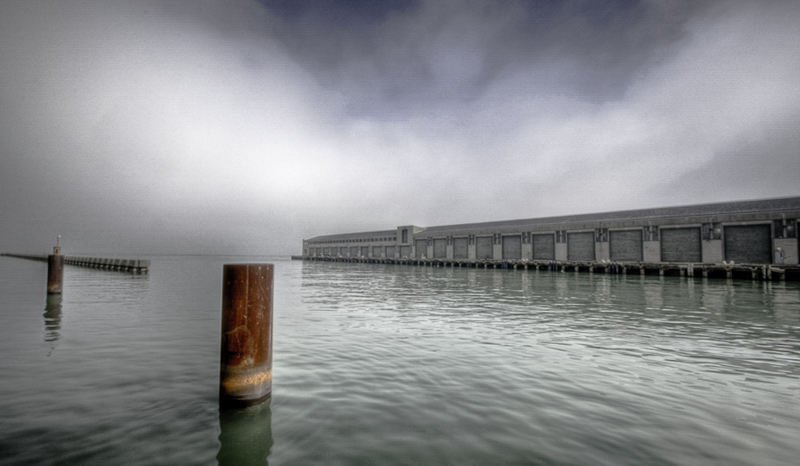 This was shot mid-morning from The Embarcadero in San Fransisco. The Nikon D90 equipped with a wide-angle lens and polarizing filter was stabilized by hand against a sturdy post. Ordinarily a tri-pod would be used along with a remote shutter release and mirror lock-up to avoid camera shake. What struck me this morning was the calmness of the vista, smell of the ocean…and how quiet everything was. In the distance, the fog was burning off the bay which eventually exposed Alcatraz. This is a shot in commemoration of October 31st, or Halloween. 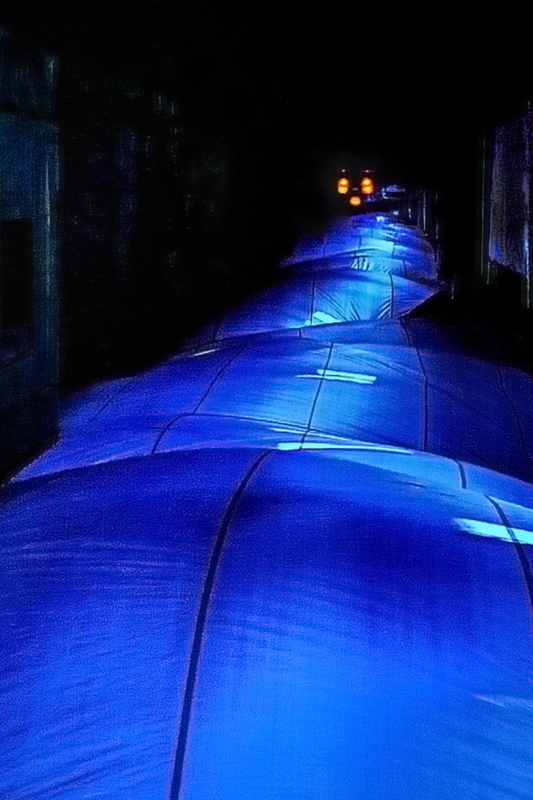 This mysterious flowing blue trail leads you into the dark where The Great Pumpkin awaits, This was taken on the Embarcadero in San Francisco. The details of this image will remain up to the viewer to speculate. I never ventured closer to the Great One as it was somewhat creepy. The Pumpkin’s eyes drove into my soul and froze me in my tracks! The Great Pumpkin is an imaginary character in the comic strip by Charles M. Schulz. The Great Pumpkin is a holiday figure (comparable to Santa Claus or the Easter Bunny) that seems to exist only in the imagination of Linus van Pelt. Every year, Linus sits in a pumpkin patch on Halloween night waiting for the Great Pumpkin to appear. Each year the Great Pumpkin invariably fails to appear, and a humiliated but undefeated Linus stubbornly vows to wait for him again the following Halloween. The Great Pumpkin was first mentioned by Linus in Peanuts in 1959, but the premise was reworked by Schulz many times throughout the run of the strip, and also inspired the 1966 animated television special t’s the Great Pumpkin, Charlie Brown. The best-known quote regarding Linus and the Great Pumpkin, originally from the comic strip but made famous by the TV special, is: “There are three things I have learned never to discuss with people: religion, politics, and the Great Pumpkin. 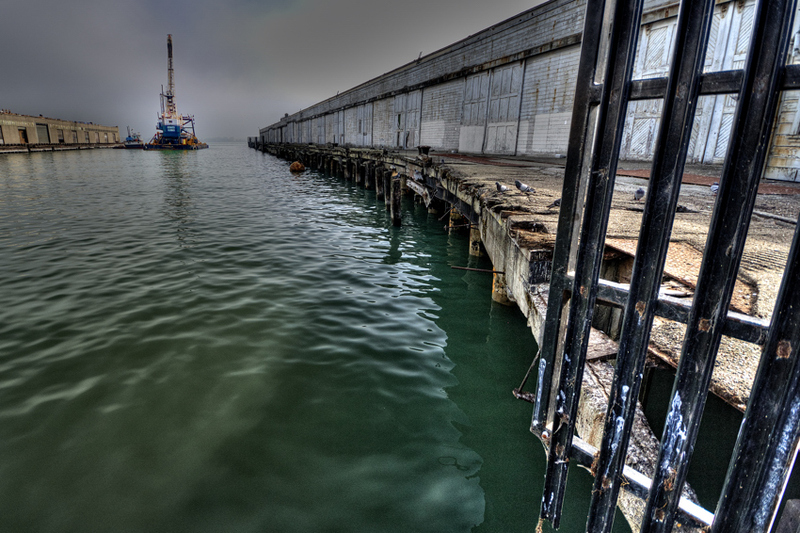 A bit of Wide Angle Photography fun on The Embarcadero in San Francisco. These ropes were securing a retired Submarine and demonstrate the correct way to tie off a marine vessel. We were instructed and later drilled in all sorts of knot techniques as part of our Off Shore Sailing License course. 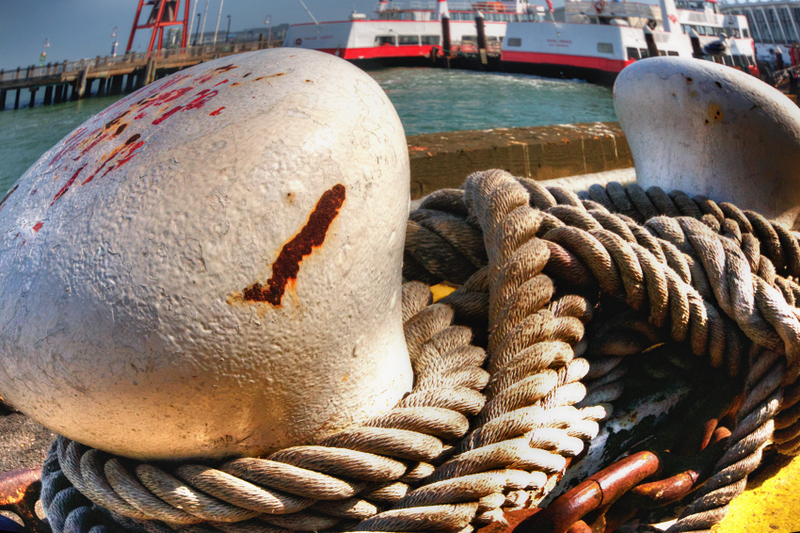 There is a large variety of knots, each with properties that make it suitable for a range of tasks. Some knots are used to attach the rope (or other knotting material) to other objects such as another rope, cleat, ring, or stake. Some knots are used to bind or constrict objects. Decorative knots usually bind to themselves to produce attractive patterns. Knot theory is a branch of topology. It deals with the mathematical analysis of knots, their structure and properties, and with the relationships between different knots. In topology, a knot is a figure consisting of a single loop, abstracted from any physical rope or line, with any number of crossing or “knotted” elements. As such, it has no proper ends, and cannot be undone or untied. Various mathematical techniques are used to classify and distinguish knots. For instance, the Alexander polynomial can be used to distinguish the trefoil knot from the figure-of-eight and the unknot (a simple loop). This image was taken during a morning shoot of The Embarcadero in San Francisco, Marine Layer thick in the background and if you look to the distance, Alcatraz! I was surprised to find this huge crane on a barge and accompanying tugboat at the end of the pier. The Embarcadero is home to many shipping businesses, a tented theatrical circus, fisheries, restaraunts, a Submarine (see earlier posts) and a Fresh Produce Market. And this is just one aspect of this amazing city. 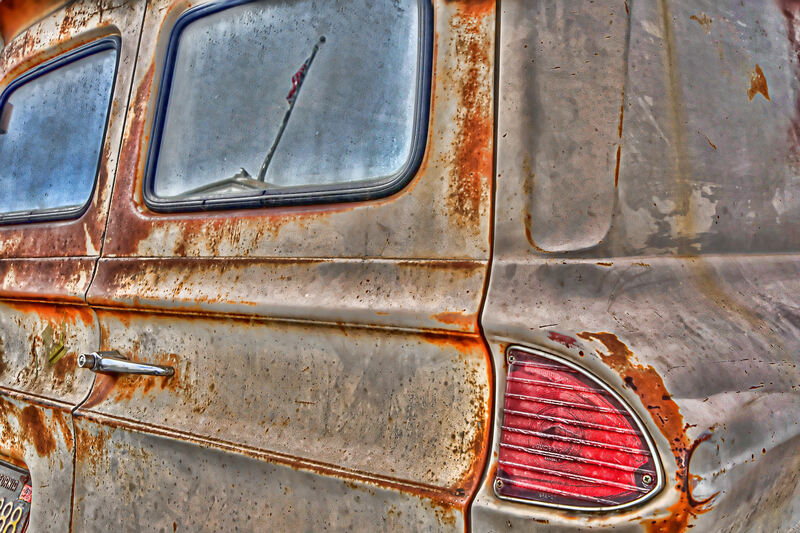 I shot this beat up Chevy truck deep in the Commercial Fishing Zone on Fisherman’s Wharf. I really don’t think I was allowed to be there but what the heck! I waited until the wind subsided and flag in the window slumped as if in resignation. This truck must have been 50 years old and still working hard – a testament of sorts. 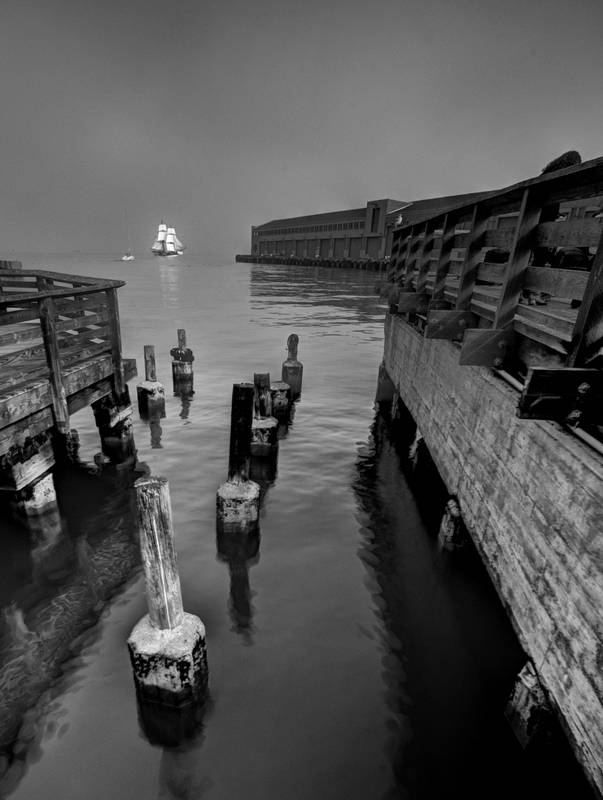 While shooting along San Francisco’s Enbarcadero, this mystery ship emerged out of the thick Marine Layer of the Bay. Could it be The Flying Dutchman?